Hi, friends. This post--appearing promptly on Tuesday morning--was intended to be a Monday morning post...can you tell I'm a little out-of-sorts? After a week at my new job, I'm slowly settling into a work routine and trying my best to balance all of the things I have to do with all of the things I want to do; perhaps you know how that goes, too?Acknowledging my late start, I'm happy to share the progress that was made on our living room carpentry projects last weekend. On Saturday, the sun was shining and it was the perfect day for some renovations! 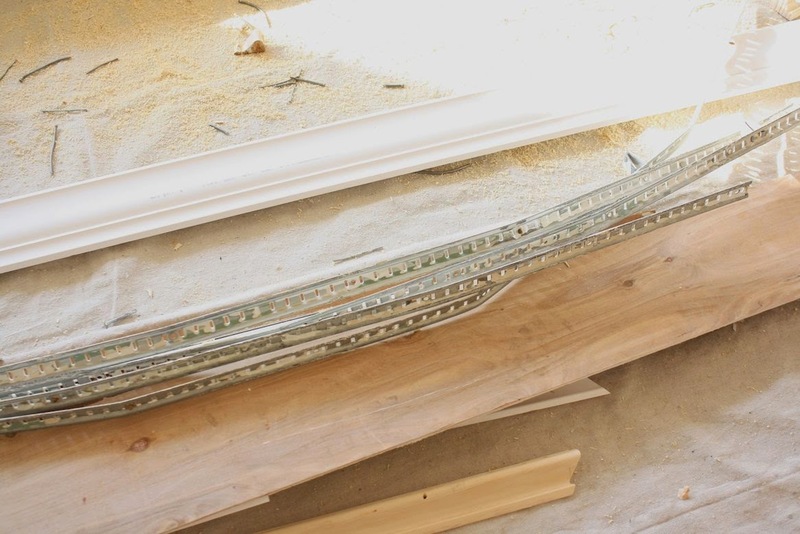 Rich, the trusty, talented carpenter got right to work installing a double-layer of crown moulding to the space (a sneak peek of that at the end of this post). The double crown adds some much-needed formality to the room. Next, he tackled our fireplace, which was previously a dimensionless-but-attractive surround that was begging for some body. 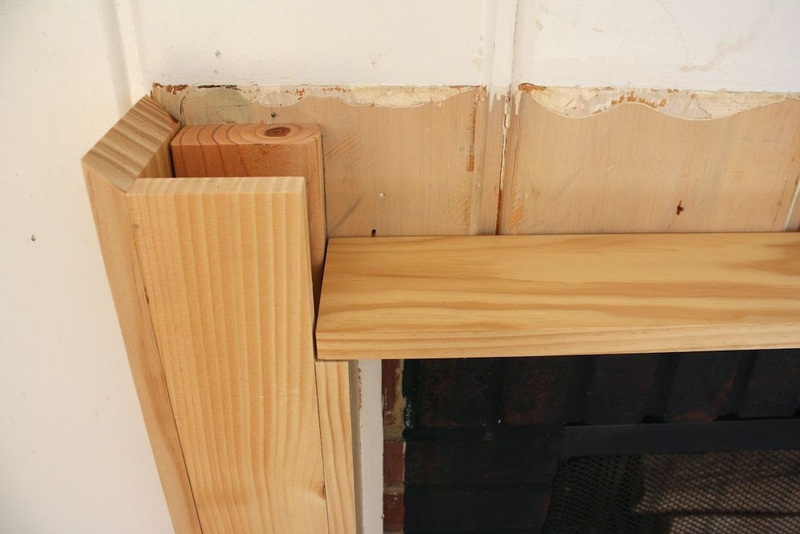 Rich carefully pried the facade from the wall so that the whole surround came off as one piece. He then got busy fashioning a box that would sit behind the original facade and provide depth and shape to the finished mantel. 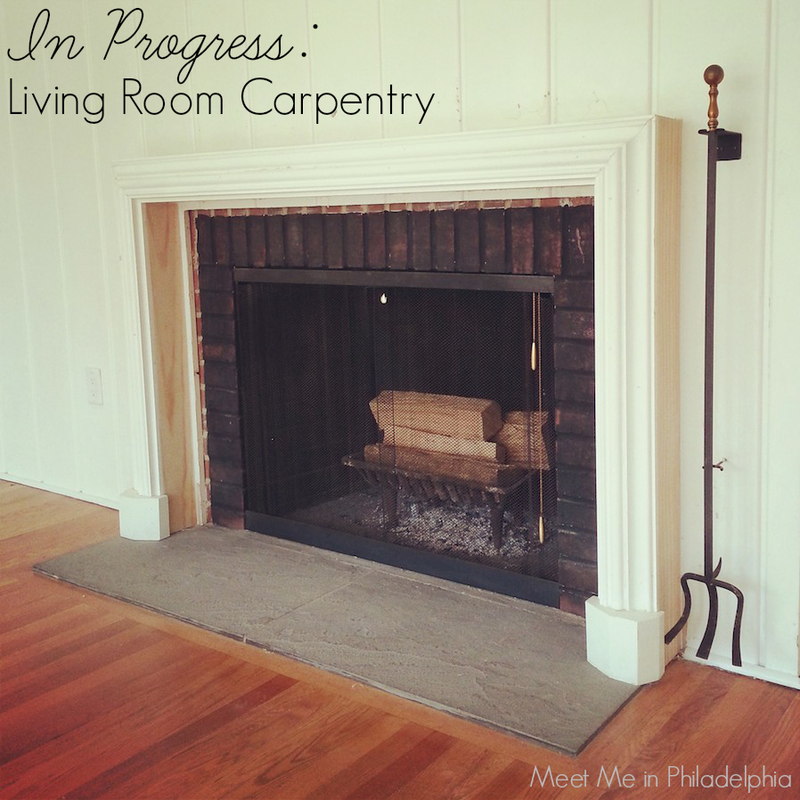 I snapped a few "process" pictures to demonstrate how this fireplace mantel box was constructed. 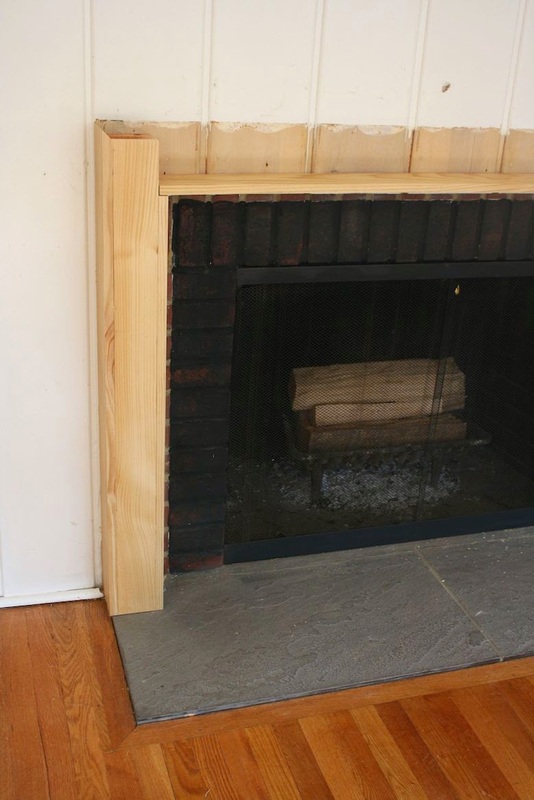 With the box complete (yes, a mantel top was installed but not shown here), Rich re-attached the original fireplace facade to this box. All the joints were caulked, and when he returns this coming weekend, he'll caulk and sand for a seamless finish. We're also going to be adding trim to connect the "feet" at the front of the facade back towards the wall for a fully-finished, custom look. Though still unpainted, the added dimension makes a world of difference, doesn't it? 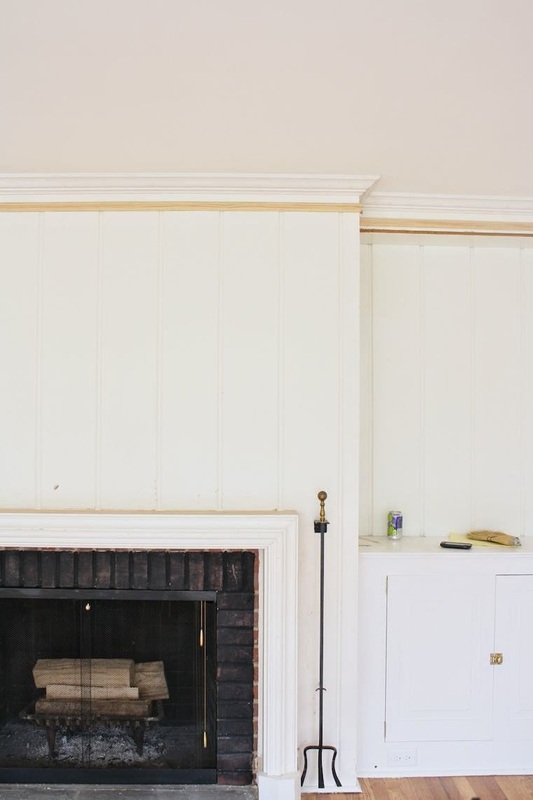 If you're curious, our fireplace makeover doesn't stop with the mantel. The sooty brick will be covered in slate to match the hearth and the existing screen will be replaced with a spark guard like this. 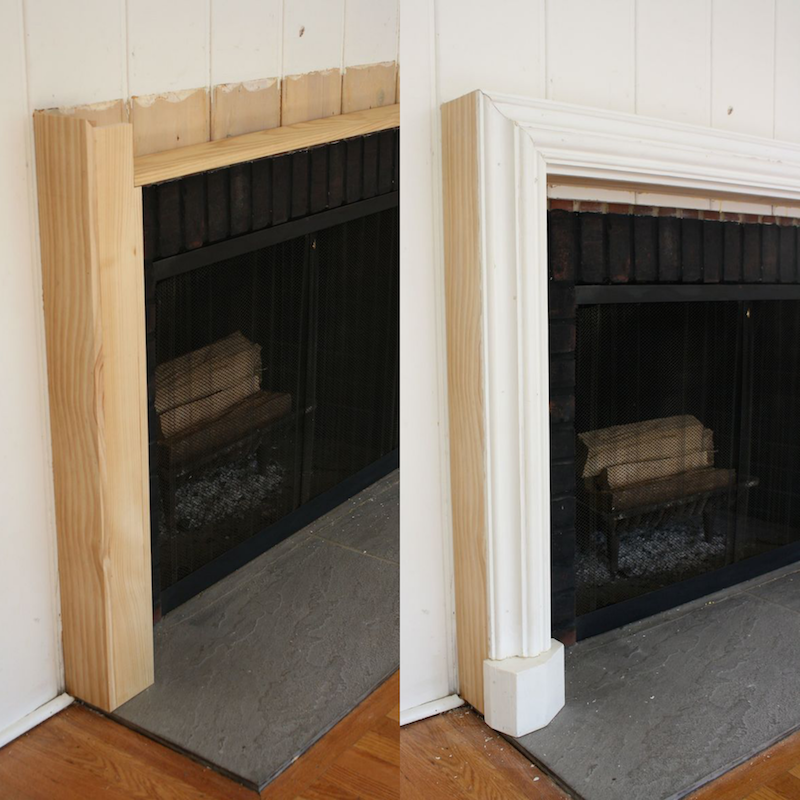 And as if the fireplace and crown moulding wasn't enough work for one weekend, Rich also started deconstructing the build-in shelving to the right of the fireplace, which was previously afflicted by a series of adjustable shelving tracks. But they're all gone now, so we can rest easy. Rich will be back on Saturday to finish the built-in shelves (they'll be permanent this time!) and I just can't wait. That means paint is next! All in all, this past weekend felt like a major success after being back to work for the first time in a long time. I am glad that progress like this is happening because it makes the transition back to work a little easier. During the past two-plus years, I know I was spearheading so many projects and tasks around here that I worried that, when I started working again, the changes would come to a grinding halt. I'm glad that's not the case. Here's to progress, and a great week to come! aahhh! so much better. now the scale of the mantel fits the scale of the fireplace...lovely change. Y'all mean business. It is amazing how much he can get done in just a weekend. It looks wonderful!! i love your word choice of "afflicted" about the bookshelves. :) I've met many an afflicted house and furniture piece. Love your direction here! 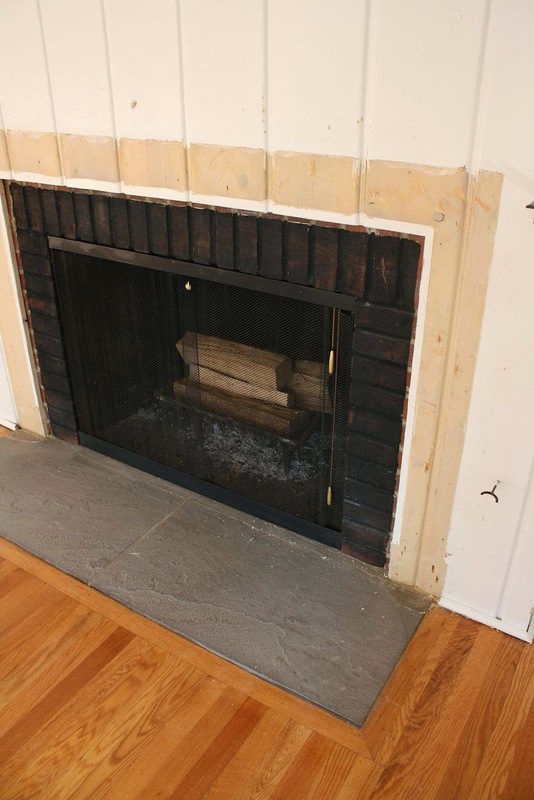 Love to hear about your fireplace redo! 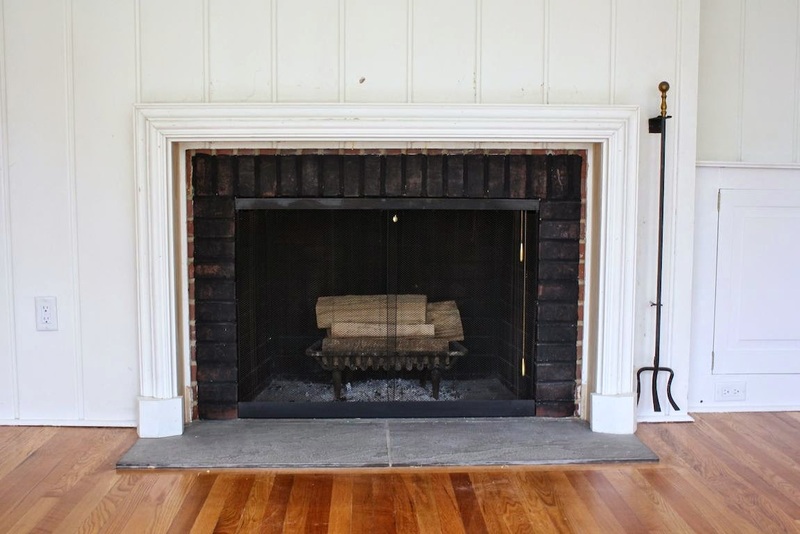 I am in need of a fireplace update too. Is rich in the Philadelphia area? If so, would you be willing to share is contact info? I hope you saw my emails--I spoke with Rich and passed along his contact info. We can't recommend him enough!